In a small bowl mix together melted butter and graham cracker crumbs until well combined. In a lightly greased 14×5 inch tart pan press your graham mixture evenly into the bottom of the pan. Put REESE Spread and 1/2 of your whipping cream into a microwave safe bowl. Heat for 1-2 minutes until cream begins to boil. Remove and whisk until smooth. Pour your REESE Spread ganache over the crust and spread into an even layer. Place in your fridge or freezer until fairly firm 10-15 minutes. Place your chocolate chips and the other 1/2 of your whipping cream into a microwave safe bowl. Heat for 1-2 minutes until cream begins to boil. Remove and whisk until smooth. Pour your chocolate ganache over the REESE Spread ganache and spread into an even layer. 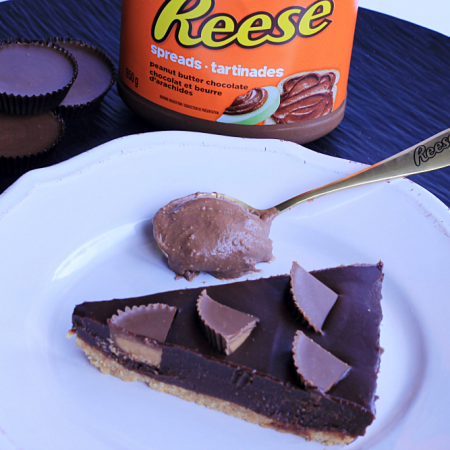 Immediately press in your REESE Mini’s into the top layer and return to your fridge for at least one hour to set.